Here’s a look at the capabilities of the Dolfin browser on the Samsung Wave Bada handset that I got at the Bada Developer Day in San Francisco on Tuesday. Dolfin is a WebKit based browser. Webkit is used as the basis of the majority of smartphone browsers including those from Nokia, Palm, Android, Apple and soon RIM. Although all these browsers are based on the open source Webkit core, as PPK points out, “There is no Webkit on Mobile”, instead there are many mobile Webkit implementations with huge differences between them in usability and rendering. The W3C test has 12 test cases and Dolfin passed nine for a score of 75%. It failed the <video>, <audio> and Web Workers test. By way of comparison, the Android 2.1 browser scored 67% and Opera Mobile 10 passed 34% of the W3C tests. Dolfin passed 86 out of 160 of the Momac tests including all parts of the Canvas, Geolocation, Local Storage and Offline Web Application tests. It’s main failure areas were again the lack of support for the Video or Audio elements or Web Workers. The Android 2.1 browser scored 118 and Opera Mobile 10 only 33 in the Momac test. So on paper at least, Dolfin does a pretty good with HTML5 compliance, what of its real world performance and usability? In most areas it’s good. Google delivers the iPhone/Android HTML5 versions of Search, Gmail, Maps and Calendar to it, all of which worked very well. 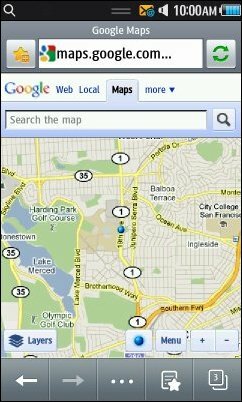 Google Search and Maps were able to retrieve and use my location. Google Maps (image top, left) is particularly impressive in Dolfin with quick, smooth scrolling and zooming. It’s hard to tell that its not a native app. Google Reader defaulted to the WAP version but I was able to load the iPhone Reader at www.google.com/reader/i/ and it worked perfectly too. The usability of the Dolfin browser is a bit of a mixed bag. On the positive side, pages seem to load quickly and pinch zooming is exceptionally smooth and accurate. Dolfin doesn’t support “Flick scrolling”, but pages scroll easily by dragging and there is also a scroll bar for quickly getting to a section of the page or to the top or bottom of the screen. A long press on the screen highlights the current word with a drag bar to enlarge the selection and a context menu to copy it, use it as a Google search query or pass it to the mobile web version of Google Translate. Copied text can be pasted into the URL bar or into other apps including email and messaging. Dolfin supports multiple windows although there is no option to open a link in a new window in the background, one of my favorite Android browser features. However, Dolfin tops Android with good support for the HTML <input> tag’s type=”file” attribute which adds a “browse for file” button and dialog to a web page. This feature is used by many file and media sharing sites. File browsing on Bada is limited to your photos, sounds and the Wave’s “others” folder which is a sort of dropbox that you can copy almost any type of file to from a PC using mass storage mode. A small thing that I dislike about Dolfin on the Wave is that there is no hardware back button. There’s an onscreen Back icon which is always visible in the browser’s “Normal” screen mode (image top, left). However Normal mode puts large navigation and menu bars at the top and bottom of the screen. The bars can be hidden by choosing “Full Screen” mode but then it takes three taps to go back a page; tapping the screen displays an up arrow icon (image top, right) which you have to tap again to get the menu with the Back icon. While the Bada Dolfin browser is quite capable and generally performs well, it has one glaring defect that makes it practically unusable for me – when you zoom into a page, text doesn’t reflow. That wouldn’t be much of a problem if Dolfin used a readable text size at the default zoom level where columns of text fit the screen width. But on every desktop page I tried, if I double tapped the screen to zoom in on a column of text, the font was impossibly small for reading, especially in portrait orientation (image above, left). I could zoom in to get readable text, but then the lines of text became longer than the screen width and required horizontal scrolling to read (image above, right), which I consider unacceptable. Things were a little better in landscape orientation, but even there many pages were difficult or impossible to read without zooming to the point where horizontal scrolling became necessary. As it is, in spite of its generally good performance, feature set and outstanding stability, I find the Bada browser ultimately unusable because of the text wrapping issue. I strongly suspect that this is an early release bug that I hope Samsung will quickly addresses as it ruins an otherwise outstanding browser. 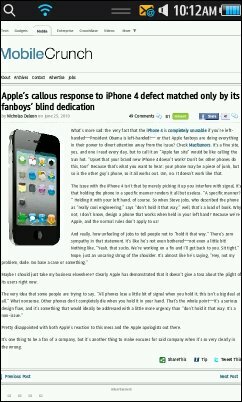 This entry was posted in Browsers and tagged bada, Dofin, HTML5, Samsung by Dennis Bournique. Bookmark the permalink. I cant save anything in my samsung B7722 through the another browsers except dolfin browser. wen i try to open facebook through the Dolphin browser using S8500, it does not allow saying that “Please enable coolies in your browser.” how am i suppose to do that..?? all other sites are working absolutely fine. please help. All streaming TV that plays on the Wave. CONTENT MAY NOT BE DISPLAYED PROPERLY. I hope, in the newer version, they have worked on text-reflow. Haven’t tested it yet though. I dont find an option to attach a file,photos on this browser,plz let mw know. bada supports pretty much every site. I’ve never seen that phone and have no idea how or if it’s even possible. You probably need a Samsung-specific modem driver on the PC. The Samsung B7722 is not a bada phone and its browser is very limited. Try using Opera Mini, Bolt or UC browser instead. … And what about FLASH ADOBE ? Is it possible to have 10th version ? i will ask this QS from that site. i have Wave II. as i want to browse my own language website in utf-8. but it displays as square box. I agree almost at all with you. This browser is incredibly capable in every way but something as simple and as necessary as reflowing text makes it a bad choice and a headache. I can’t understand this kind of mistakes. yes, text reflow and font size is a real teasing issue. one solution is to use tikisurf for bada available free from app store. but some web site don’t show me completely why ?? Not sure what you mean, but font support seems pretty comprehensive with serif and san-serif fonts in a variety of sizes and style including bold, underline, overline, strike-through and small-caps. I just wanna, listen my radio station on my samsung wave, but the flash player always stop after 3′ minutes ! Do you resolve this problem ? double click with your finger a second time after zooming and you will get text reflow and resize. @text reflow that is exactly what I did once I played with the phone (same trick with the Nexus one after pinching to zoom in/out) and nothing happened. Upgrading Dolfin can only be done as part of a firmware upgrade. select boxes dont work on wave but work on computer under ie anf ff. Is this fixable? Not sure what you mean by “select boxes” but html select tags (dropdown lists), radio buttons and checkboxes all work fine for me in Dolfin. The issue you’re seeing is probably site specific and caused by invalid markup. 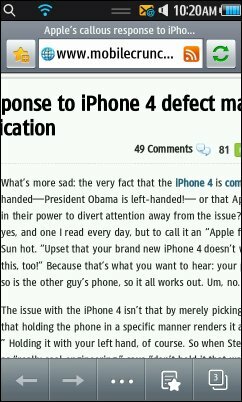 Well, I agree with everything said but it is still much better than Opera Mini 5. And for what I’ve seen it is the best browser and smartphone available for browsing. I can really enjoy browsing now finally. I even do it from bed when I wake up without needing to wake up and go to the computer. I read all the newspapers comfortably. I can read almost every site and it is the best substitute for a computer that I have yet seen. Of course, still limited, but to me the best out there. Anyone disappointed with Dolfin have several options available until Samsung get their act together. You might want to try Opera Mini or BOLT. They are downloadable directly from their web sites. And before before anyone asks they are not available from Samsung Apps because they are Java. I also can’t access my google apps account with this browser, as it says the cookies are disabled, although the menu option shows enabled. will probably return the phone in a couple days because without e-mail and GPS, it’s useless to me. Is there any solution to this text re-flow thing? Like an add-on or new version or something? I REALLY need to solve this. If there’s no solution, is there any other browser that supports this which i can download and install on my Wave? Fixing the browser would probably take a firmware upgrade. I don’t know if one’s available. I suggest you look on the bada developer site. http://developer.bada.com (free registration required). As for a different browser, bada only allows installing apps from the Samsung App store. Last time I checked their were no browsers there. Yeah, it is definitely disappointing that the browser doesn’t support text re-flow, which renders it unusable in my eyes too. There are two things I hate not seeing in a mobile browser. The lack of text re-flow and the lack of an easy way to see page overview when the page is opened at 100% zoom level. 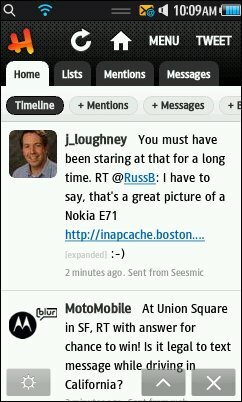 The same lack of text re-flow drives me crazy on the Nokia’s touch screen device browser. Double-tapping the screen zooms in and makes sometimes too small fonts more legible but the lack of text re-flow makes the whole double tapping thing on S60 5th edition unusable. Luckily the font size at 100% is pretty decent in most cases and I don’t need to zoom in any further.